Some trends in staffing are all flash and no substance, but there are some Seattle staffing trends worth adopting. These trends can help you adapt quickly to changing circumstances in recruiting and hiring. They will help you attract and retain top talent in a tough hiring market. Seattle has been one of the hottest hiring markets in the country, and this market is likely to continue into 2018. Competition for top talent will remain fierce, with the best candidates regularly considering multiple job offers. Even though the candidate market is in full swing, it’s never too late to coordinate with a recruiting firm to improve your access to quality candidates. Staffing firms specialize in knowing where to find top talent – including which key players aren’t actively looking for jobs, but would consider a move to a company that offered an outstanding workplace culture or real opportunities for advancement. Despite the fact top talent is scarce, many Seattle companies are still extending the hiring process to an average of 4.5 weeks. This trend creates a key opportunity to stand out from competitors – and pick up the best talent – by streamlining your hiring process. Your recruiter plays a key role in shortening time to hire, from screening candidates, to helping you improve the interview process, to making the best decision. While dragging your feet isn’t a trend to adopt, a more efficient hiring process is. Automation isn’t killing Seattle-area jobs (yet), but it is changing the skills that top candidates need to stay nimble and relevant in their fields. Coordinating with your recruiter can help you understand the ways in which automation is placing new demands on the workforce, so you can hire candidates with the skills to keep pace with changing technology. 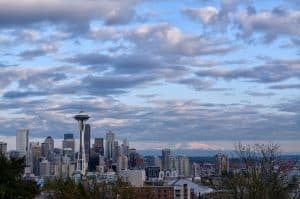 At TERRA Staffing, our recruiters can help you identify which Seattle staffing trends are worth following. We can help you implement them to improve your candidate reach in the new year.